This beautiful one of a kind platform bed is made of rustic teak wood. It is available only in queen size. It is handmade and has the artisan slightly rustic handmade look. 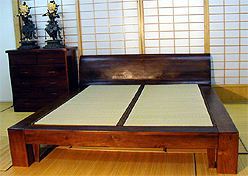 It is made in a simple way using basic carpenters hand tools characteristic of Southeast Asia. Available with or without the tatami rice mats.